When it comes to user experience and immersive game play, smartphone apps just can’t compete with actual gaming devices. But that isn’t stopping iOS and Android apps from financially trouncing the big kahunas like Sony and Nintendo. Mobile analytics firm Flurry has data confirming that the two smartphone platforms are yielding even bigger bucks for game devs. 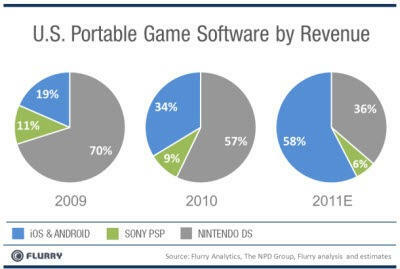 Case in point: Two years ago, they accounted for 19 percent, or just less than one-fifth, of the portable game market in the U.S. Back then, the Nintendo DS had a whopping 70 percent, with the Sony PSP laying claim to 11 percent. Fast forward to the present, and Android and iOS make up 58 percent of this market, leaving the DS to just 36 percent. And poor PSP, it’s only rocking about 6 percent these days. Why the change? Well, the experts can chew over this ad nauseum, but I figure it’s like a fast-food scenario: Some of us grab what we can on the go because it’s fast and easy, not because it gives us the best dining environment or tastiest dishes. No doubt, launching an application store/market, tapping for an over-the-air download, and paying a super cheap price all makes for a trifecta of ease and budget-friendliness that’s hard to top. Not that Sony and Nintendo aren’t trying to compete with this downloadable “happy meal” experience, but the transaction/procurement process is still predominantly based on physical delivery. The smartphone/tablet environments aren’t resting on their laurels either. The stores are bursting with titles, both basic and robust, and more are landing all the time. Meanwhile, hardware specs are increasingly being optimized for gaming. But even if there weren’t more titles and better specs afoot, the simple fact of the matter is that there are just more people using smartphones these days — with as many as 250 million iOS activations and 190 million Android devices in the wild. That’s an awful lot of users for whom separate handhelds (plus cartridges) just won’t fly. The stakes are high for Nintendo and Sony. The 3DS didn’t quite do it, and at this point, all eyes seem to be fixed on the upcoming PS Vita. Whether it will be enough to turn things around remains to be seen. What do you think? Is there hope that either of these titans of portable gaming can reclaim their previous glory? Weigh in.